Quarry is the latest crime thriller from Cinemax, filling in the vacancy left by the cable network’s neo-noir crime thriller Banshee, which recently ended its four-season run. Quarry, based on the novels of Max Allan Collins, is just as gritty, but somewhat more grounded in reality than the colorful characters of Banshee. Set in 1972, the series follows one Mac Conway, a Marine who returns home to Memphis, Tennessee after two tours of duty in Vietnam and involvement in an alleged war crime that shook the headlines. After facing an enormous amount of protests, resistance, and shunning from strangers and even his own family (his father, now married to someone other than Mac’s mother asks him not to come around the house anymore because of all the scandal about what happened back in Vietnam), Mac finds it nearly impossible to find a job and settle back into a normal life with his wife Joni (Jodi Balfour). That’s when he is approached by a dubious man calling himself “The Broker” (Peter Mullan) who offers him work around Memphis and up and down the Mississippi River area as a hitman . The Broker even offers a $30,000 advance. Mac turns him down, but ends up inveigled with The Broker anyway after his Vietnam vet buddy Arthur (Jamie Hector) ends up dead doing a job for The Broker that Mac agreed to help him out on. The Broker insists on getting his money back and threatens Arthur’s wife and children, who knew nothing about his arrangement or what is going on. In order to work off his debt, Mac, who The Broker calls “Quarry”, now becomes his latest hitman. Quarry is a world of seedy bars, gator swamps and roadhouses set against the backdrop of the chaotic 1972/73 election campaign, Vietnam war protests, and the underground drug smuggling from South East Asia. The mystery of “The Broker” and these “bad guys” he wants Quarry to kill is what drives the series. It is, at its core, a basic story of crime, greed, and desperation. On the one hand we have a Marine who, by today’s standards would have been diagnosed with PTSD, who is clearly struggling to adapt to life back at home, and on the other hand the ruthless underbelly of the Southern underclass, as it were, ready to take advantage of him in order to make a buck. While some things aren’t always so clear in the story (I didn’t really understand at first that Mac was working off Arthur’s debt to keep Arthur’s family from being hurt) and the writers go to great pains at times to mix in the turmoil of the era like civil rights, the assassination Martin Luther King just a few years earlier, the rise of feminism and the early signs of gay rights, those things all feel like they are being shoehorned into the main story, which is a basic period crime thriller. That crime thriller is made best by the superb acting of its cast, the excellent production design by Roshelle Berliner and costume design by Patia Prouty that puts us right into early 1970s Memphis, and the musical soundtrack of the period, both through album cuts of the period and live performances. 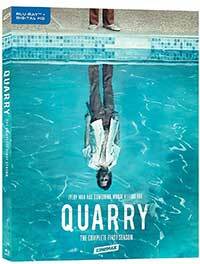 Quarry comes to Blu-ray in an AVC 1080p encodement. It’s an often gritty looking, desaturated image that in no way looks bad because of those things. The grittiness enhances the atmosphere of the series, which looks very filmic and organic on Blu-ray. The contrast is excellent, but flesh tones can look slightly pallid due to the artistic choices. The English DTS-HD Master Audio 5.1 mix included on Quarry: Season 1 is wonderfully balanced. It both conveys the dialogue-driven crime thriller in its quietest moments with all the atmosphere of the Mississippi and its chirping crickets and full, clear dialogue, but the louder, violent outbursts of gunfire and fisticuffs with solid midrange and deep lows. The mix also shines with the excellent early ‘70s soundtrack of soul music and southern rock that fills the channels, sounds dynamic and lively. The final episode treats us to the sounds of war and it is the most aggressively mixed episode of the season with grenades, machinegun fire, screams, planes overhead and a nicely extended low-end. We get a lot of behind the scenes/making of featurettes and additional and extra scenes that, with this series, expand the world and mythology of Quarry, like the extras that often accompanied another Cinemax series this one replaces, Banshee. Love Letters (1.33:1; 1080i/60; 00:01:21) – “Joni”s and “Quarry”s cassette tape recordings to each other during the Vietnam War are played against the backdrop of their home movies. Quan Thang Inquiry Scenes (1.78:1; 1080i/60; 00:19:59) – The inquiries into the alleged war crime in which Quarry took part in back in ‘Nam. 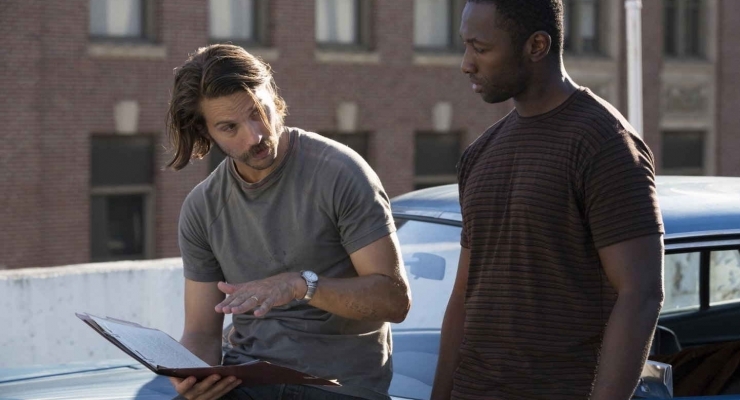 Quarry has a lot of room to grow, but in its first season this new period crime thriller from Cinemax laid down a solid foundation upon which to build. The solid cast, excellent production design, and taut direction make it binge-worthy viewing on this solid Blu-ray set from HBO Home Entertainment. This first season of Cinemax's new period crime thriller Quarry sets a solid foundation for itself with a lot of room to grow. The gritty action, solid acting from the entire cast, taut direction, and excellent musical soundtrack make it a binge-worthy series.